Clutter can instantly ruin the appearance of a beautiful and well-designed home. Clutter can also create chaos in our minds, adding unnecessary stress and negative energy to a room or an entire house. It’s ironic how many random items we store; many of them completely useless, yet we often find these difficult to part with. This infographic from HappyCleans looks at ways you can reduce the amount of clutter in your home significantly in just 21 days. Many of us have piles of old bills and letters taking up valuable space. Sort through these quickly, disposing of any you don’t need and organize those you plan on keeping. Try to move to an electronic system to reduce overall paper usage. Magazines and books fall in a similar category and often just sit in piles for years without being touched. Again, donate or recycle any you don’t plan on reading again and organize the rest. Another common area in a house is a junk drawer. This is usually filled with the most random items that would likely be better off in donated, recycled, upcycled or disposed of. This drawer should be for miscellaneous items that you still use on a regular basis; not just random objects. 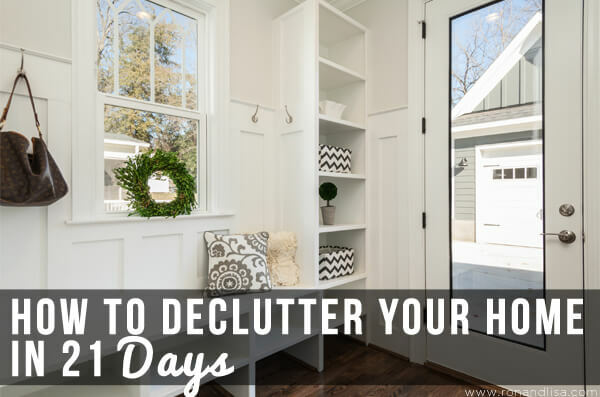 Here’s the challenge: Try to declutter for 21 days straight and see how much better your home looks and your energy feels. Also, don’t lose faith if you miss a day. We know life gets busy and it’s easy to get distracted and fall back into old habits. Just get back on your decluttering journey the following day and you’ll transform your home in no time. Check out the full infographic below now to learn more decluttering hacks.